Artist decided to come back to the country she liked a lot some short time ago. A different place in the same country provoked a totally different fusion of feelings/illusions/impressions/inspirations.The original plan became something totally else. The idea after the first original idea was dismissed due to the interactions/energies from around the artist in the village and place where she stayed, became something quite sharp, hermetic and one dimensional. The idea was to build a human sized dog house with a little open part for eyes and space for one more person to fit at the same time with the artist. 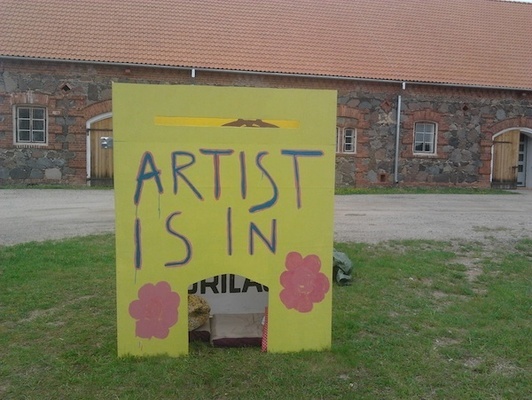 The artist would spend most of the time in it during the long Estonian days with breaks when she needs to go to toilet and take food and water. This was supposed to be a symbolic presentation of how the artist felt during her work and artistic process while trying to interact with viilage. She didnt get through. And even if she would, she needed to repeat process of animating people every day from the beginning, and also she felt without any support as the artist, also lonely and isolated due to the poor interactive skills of her personal and professional enviroment. What had been exchanged felt insufficent. Deciding to be persistent inside her pursuit of interactive fluid in the village she entered inside of the project with decision to live day by day and making a decision to make one thing for the end, forgetting that she is involved inside of procces art where something like that can't function. 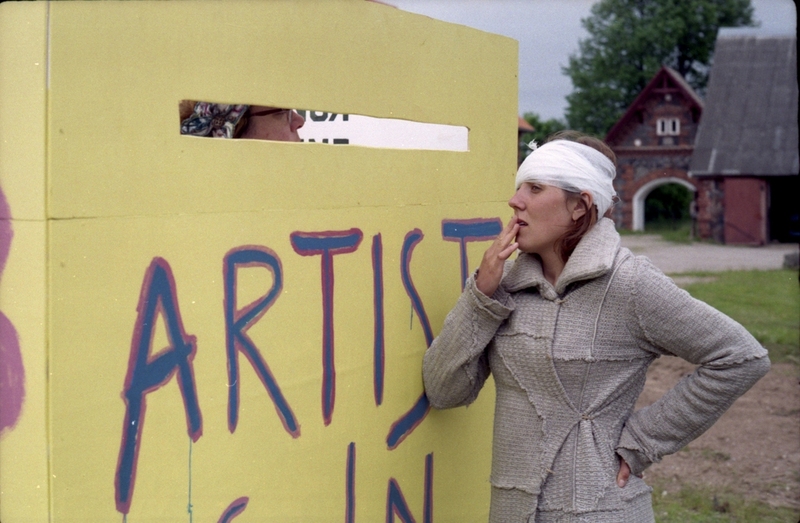 At the end one thing provoked other, and artistic ideas/suprises came out of this "failure" moment of artist. This is also a lesson for life, as the artist understands it. Failure doesnt need to be the end of something, it can be the beginning and a good one. It is always nice to be reminded of this. So out of this whole process of trying to make something hermetic, static and authentic turned out another piece of perfomance, a "house" in which the artist will be passing her time through a couple of days. The House feels open and energised as it has contact to ground and doesnt have a roof. The concept is that artist will be passing a couple of hours in the day or night in the house doing whatever. Everybody around from village is invited to come and visit the artist around or inside the house and then interactions will appear. The idea was inspired by feelings which the artist felt while staying in Moks, which is known as the artist house/place in Mooste, isolation like there is one body "artist" and the rest of bodies which are people living in village. Also she felt isolated and lonely as there werent many concrete and creative promising interactions even on the everyday life level with people around her. The house was supposed to present how she felt but more visibly as she would build her own house and put herself in the center of the village so that everybody could see how isolated she is. The time passed inside was all the time that the artist wanted to dedicate to the place like this with her energy and creation. Having a quality exchange and to understand and learn something through it. Also the artist wanted to move the house around to different more central and visible spots, to open up her house to be seen by the most number of people. The house which appeared after the process of "building" turned out to be not a hermetical one, but open and inviting one for everybody in village. And this is exactely what happened on the first day when house was exposed in central square of village. People, kids, animals and just random observers participated and interacted with artist in her house and she with them. They gave each other some genuine moments shared together. The house became an invitation ,not a judgment and the village accepted it. Also the house became a "live" object about which the artist needed to take care of as the weather was bad and the house was freshly painted. The house also became the platform for personal THANK YOU moments from artist to all that interacted with her as well as for other personal messages, all that random houses usually are. A live, changable platform which reminds but also opens up to change about the subject of being a foreigner or "different" in one specific community and how for the human race is also difficult to cope with this "other". In one small community we can see the "pattern" which can universally be introduced to any other place in the world. The name of the perfomance "Artist is IN" has two meanings, one that literally means the artist is in the house, so people should know that they can know more or less what they can expect inside, and also the artist is IN, like it is used in slang language, where it is said that something is IN which means it is popular. This other meaning the artist wanted to present as well as she wanted to provoke the village a bit telling them that art in general and the artist as such is IN today, it is not something that people should be afraid of, or ignore or throw away, it is something that should and could be "used" or to interact with!